I saw a TED talk that made me think about resilience, and how it’s such a broad and useful concept to have in your mental repertoire. You can apply it to anything and it will give you useful, practical ideas. This example is access to food, but I think the general formula can apply to anything. For a culture that praises individuality and “making it on your own,” we’re pretty dependent on other people and external systems. That’s not necessarily bad, but for some people it sets off an internal alarm bell – what if these external systems were to fail? That idea is not implausible. It happened to every society that went before us and many more that once existed concurrently to ours. Many factors determine who is psychologically resilient and who isn’t, and I can write about that if you want. But for the moment let’s expand the idea outside of psychology and into one of the basic survival needs – food. How resilient is our access to food? Without either of these two things, you can’t get food. How resilient is your income? How secure is your job? What’s the economic outlook? Do you have savings? Is your currency’s value going to hold? Shops rely on transport, which relies on fuel, which relies on the price and availability of oil. If oil prices go up, so do food prices. If your country is a net food importer, its system is fragile to the same extent as the countries from which it imports. Lots of other things could affect your access to money and your local supermarket’s access to food for it to sell. Look into them. For each one, ask yourself, “What would happen to my access to food if this happened?” For example, if oil prices went up, if you lost your job, if the government cut back unemployment benefits, etc. Resilient systems can absorb trauma and keep going. Fragile systems crumble. 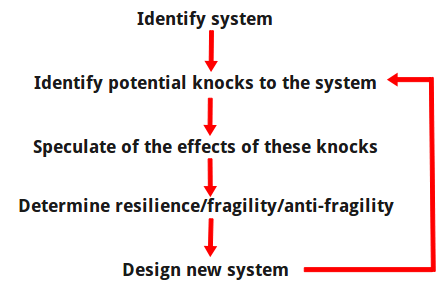 Anti-fragile systems  get stronger through trauma. Now that you’ve researched and thought about it, is your “access to food” system resilient? What about in five years, or ten years? If you consider your system resilient, let me know why – Do you have a garden? Will the market provide? Are you Ray Mears? If you can maintain your access to food in the event of the factors you identified earlier, your system is resilient. What might this look like? And so on. These are resilient to wider, global problems and hence are more resilient. But each one of these are fragile to different factors. If everyone in your town learned to forage, the skill would be useless if everyone quickly stripped the land. So you might have to go through this process several times, thinking out contingencies. I like the general process though and I think it’s worth going through these steps for a number of key areas (food, water, transport, energy, health, mental health, community, entertainment… etc). Naseem Taleb has argued that these two concepts – resilience and fragility — are not opposites. The opposite of fragility, he argues, is anti-fragility – a quality whereby variance actually strengthens its possessor, as opposed to its possessor being simply immune to the negative effects of variability. A related concept in psychology is post-traumatic growth, which is a positive psychological-style approach to reaction to trauma; and a valid viewpoint I think – if you only study post-traumatic stress, that’s all you’ll find.